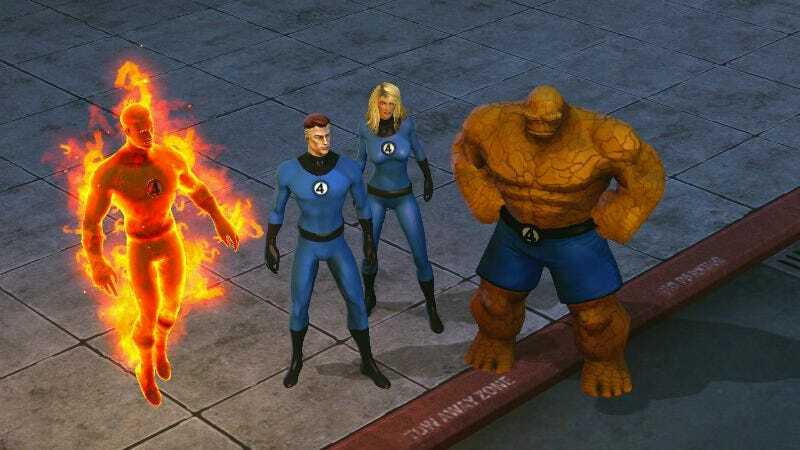 The Fantastic Four aren’t getting a lot of love in Marvel Comics at the moment, and now that lack of love looks to be extending to Gazillion’s massively multiplayer Marvel Heroes. Starting July 1, players will no longer be able to purchase Fantastic Four characters or costumes. According to a post on the Marvel Heroes forums yesterday, players will be unable to buy The Thing, Invisible Woman, Mr. Fantastic or the Human Torch as of July first. Unlocking the characters via in-game currency is also being suspended as of today. Under Gazillion’s renewed licensing agreement we do not have the rights to continue selling these characters moving forward. However, players who have already purchased or unlocked any of these affected characters and costumes before July 1 will be able to them continue playing them as usual. While the changes do not affect Doctor Doom, a character who plays a large part in the game’s storyline, frequent FF guest Silver Surfer is also being pulled from sale, as well as costumes for characters like Spider-Man and Ghost Rider that make reference to Fantastic Four comics continuity. Players who have already purchased Fantastic Four items can continue to use them, and Gazillion has pledged to continue supporting the existing characters with balance tweaks and updates. The licensing change likely has something to do with Marvel cooling its heels on the Fantastic Four, perhaps in a bid to make the property less attractive to Fox, owners and frequent mishandlers of the team’s movie rights. We’ve reached out to Gazillion for more info. Here’s a full list of the costumes that will no longer be available for sale come July 1.